Do not adjust the rearview mirror while the vehicle is moving. This could result in loss of control. Pull the day/night lever toward you to reduce the glare from the headlights of the vehicles behind you during night driving. Remember that you lose some rearview clarity in the night position. The electric rearview mirror automatically controls the glare from the headlights of the vehicles behind you in nighttime or low light driving conditions. 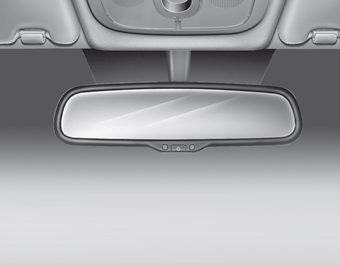 The sensor mounted in the mirror senses the light level around the vehicle, and automatically controls the headlight glare from the vehicles behind you. Press the ON/OFF button (1) to turn the automatic dimming function off. 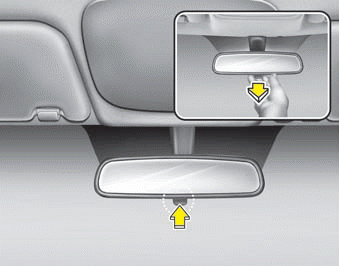 The mirror indicator light will turn off. Press the ON/OFF button (1) to turn the automatic dimming function on. The mirror indicator light will illuminate.